Base Notes: vetiver, sandalwood, musk, amber Sparkling top notes of grapefruit, bergamot and lemon reveal a luminous heart of iris and rose, interwoven with an herbal twist of rosemary and thyme. The fragrance finishes with a luxurious base of blonde woods, vetiver, musk and amber. Beautifully boxed; 100ml natural spray. Made in England. Berkeley Square, Mayfair - Summer 1988. 'After a period of becalming in culture, London felt alive again. Confidence and pride was everywhere; we were in love and having fun'. 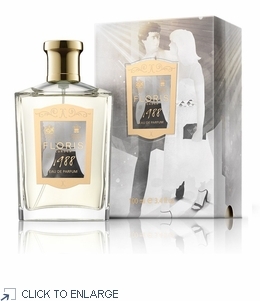 1988 Eau de Parfum is a fragrance of confidence with a splash of flamboyance which hints to a sparkling era of culture. Mayfair, alive with entrepreneurial spirit and enterprise. Sparkling top notes of grapefruit, bergamot and lemon reveal a luminous heart of iris and rose, interwoven with an herbal twist of rosemary and thyme. The fragrance finishes with a luxurious base of blonde woods, vetiver, musk and amber. FROM THE FRAGRANCE JOURNALS COLLECTION: The Fragrance Journals are a series of three unique Eau de Parfums, capturing the heart and soul of London throughout the decades of the 1960s, 1970s and 1980s. Each fragrance weaves and knits its way through the fabric of a key moment, district, and culture of the time, bringing out a true reflection of a city which has the ability to both adapt to change, yet remain rooted in its identity. A love letter to London, its social fabric and its people. Sparkling top notes of grapefruit, bergamot and lemon reveal a luminous heart of iris and rose, interwoven with an herbal twist of rosemary and thyme. The fragrance finishes with a luxurious base of blonde woods, vetiver, musk and amber. Beautifully boxed; 100ml natural spray. Made in England. Berkeley Square, Mayfair - Summer 1988. 'After a period of becalming in culture, London felt alive again. Confidence and pride was everywhere; we were in love and having fun'. 1988 Eau de Parfum is a fragrance of confidence with a splash of flamboyance which hints to a sparkling era of culture. Mayfair, alive with entrepreneurial spirit and enterprise. The Fragrance Journals are a series of three unique Eau de Parfums, capturing the heart and soul of London throughout the decades of the 1960s, 1970s and 1980s. Each fragrance weaves and knits its way through the fabric of a key moment, district, and culture of the time, bringing out a true reflection of a city which has the ability to both adapt to change, yet remain rooted in its identity. A love letter to London, its social fabric and its people.